Sweden is a Scandinavian country with incredible geographic diversity and tons to see and do. Ranging from boreal forests to glaciers and the buzzing metropolis of Stockholm to rural fishing villages, there's no bad time to visit Sweden. While Sweden has much to offer visitors any time of year, generally the best time to visit is May through September, especially if you're seeking warm weather. During these months, the days are long and the country's natural beauty is at its peak. If you're on a budget, you may want to avoid the summer high season. If you like winter sports, skiing and dogsled riding are huge attractions. It's up to the individual traveler to decide what appeals to them, but Sweden has weather, events, and things to do no matter the season. Sweden's climate is mostly temperate, despite its northern latitude. While Stockholm is warmer and milder, the mountains of northern Sweden are sub-Arctic. There is an important weather divergence between northern and southern Sweden: The north has a long, harsh winter of more than seven months, while the south has winter weather for only two months and a summer of more than four. On average, Sweden receives between 20 and 30 inches of precipitation per year, making it drier than many other countries. Most rainfall occurs in late summer, while snow falls, predictably, in winter. Parts of the north have snow on the ground for more than half of the year. During the summer months, the entire country experiences pleasant temperatures that usually hover around 60 degrees Fahrenheit. However, during winter, there's much more variation, with temperatures ranging from freezing all the way down to 5 degrees Fahrenheit near the Finnish border. The most popular time of year to visit Sweden, at least as far as tourist activity goes, is mid-to-late summer. The weather is warm and pleasant and there are plenty of outdoor events and activities, including swimming at some of Sweden's beautiful beaches. This includes many clothing-optional beaches if you're feeling a little Bohemian. During the month of June, you can avoid the late-summer crowds and still experience outdoor events (like Midsummer's Eve) and activities, warm weather, and the long hours of daylight known as the Midnight Sun. May and July are also good options for the visitor who likes outdoor recreation. Be advised that Sweden typically sees more rain in May than in June, and while July is warmer, it also has larger tourist crowds. July and August can also be slightly more expensive than the earlier summer months. This is considered peak tourist season in Sweden and much of Scandinavia. The natural phenomenon known as the Aurora Borealis, also called the Northern Lights, occurs when electrons stream toward the Earth along its magnetic field and collide with air particles. The air then lights up, providing a spectacular visual display. While Norway is typically the best place to view the Northern Lights, they are generally visible from most points in Sweden—provided that it's not cloudy. Northern Lights season typically lasts from the end of September through April. From April through August, the sun barely sets at all, diminishing any chances of seeing the phenomenon. The further north you go, the better the view of the Northern Lights. Typically, the region between Jokkmokk stretching upward toward Norway is usually considered the best viewing area. Sometimes, during times of high solar activity, the Northern Lights can be seen from as far south as Stockholm and Gothenburg. Like much of Scandinavia, Sweden can be an expensive country to visit—but it doesn't have to be. If you're a budget traveler trying to decide when to go to Sweden, late August and September are your best bets. Flights to Sweden will be cheaper than during the high season, as will local hotel prices. And the weather in Sweden is still mild enough for outdoor attractions at this point in the year. If you want to further save money on your trip to Sweden, look for flights from low-cost carriers, like Easy Jet or RyanAir. Once you know when you're visiting, you can also save money by booking your rail tickets early (the best fares are typically seen 90 days out) and choosing budget-friendly accommodations, like a hostel. Outside of the city, camping is a great choice—the country has incredibly friendly laws that allow you to pitch your tent anywhere that's uninhabited. Any month between November and March will be cold and snowy in Sweden. There are times when the winter sports areas are busier than others, however. The most popular times to visit Swedish ski resorts are late February, March, and December. There are 200 ski resorts in the country of Sweden, with the most popular downhill ski slopes at Åre, in central Sweden. Resorts in Dalarna, Härjedalen, Jämtland, and Swedish Lapland are also popular with visitors and local skiers. Vinterfest, one of Sweden's biggest classical music festivals, takes place each February in Dalarna. Stockholm Design Week is held in early February, drawing in crowds of designers and retailers. The Nobel Prize-giving ceremony is held every year in early December. The invite-only ceremony draws members of the Royal Family as well as other esteemed academics from around the world. Spring is a great time to visit Sweden: It is still off-season, with low travel prices, and with warmer weather arriving, you can expect to find spring flowers and green landscapes. While the climate is still somewhat unpredictable, days are generally warmer, with flowers beginning to bloom. You'll experience 13 hours of daylight or so throughout the spring. Walpurgis Eve (Valborgmässoafton) is held on April 30. It's typically celebrated throughout the city with bonfires. April 25 is Stockholm Culture Night. More than 300 free cultural events take place throughout the city. Summers in the north are short and cool, but the rest of the country is generally very comfortable and quite warm. Swedes love celebrating the long summer days by flocking to the coast and inland lakes. For visitors, summer is among the best season to visit, with countless outdoor events and attractions. Crowds are common, but worth it thanks to the beautiful weather. 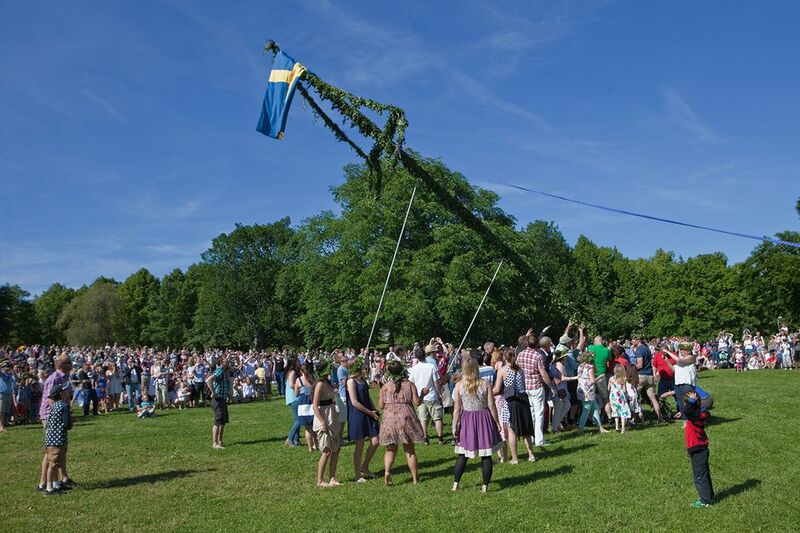 The whole country celebrates Midsummer Eve in June. Accordion-playing and dances around the maypole are the most typical celebrations. The International Festival of Folk Dance and Music, or Rättviksdansen, takes place biennially in Rättvik. The event draws more than 1,000 folk dancers and musicians from all over the world. Fall in Sweden can often be quite rainy, as wet air masses blow in from the Atlantic Ocean. Fog is common as well. In the Northern regions, snow and frost will begin by mid-October. September, in particular, can be a nice time to visit, as temperatures are typically still above 60 degrees Fahrenheit. The Göteborg Book Fair takes place every September in Göteborg. It started in 1985 as a trade fair but is now the largest literary event in Scandinavia. The fair brings in more than 800 exhibitors and 100,000 visitors to Göteborg. The Stockholm Jazz Festival, established in 1980, draws jazz and blues fans to the city each year. The festival takes place in mid-October at the Skeppsholmen, which is set against the city's harbor. Do I Need a Tourist Visa to Visit Sweden?